Controlling microbots This image shows a "microforce-sensing mobile microrobot" juxtaposed against a U.S. penny. 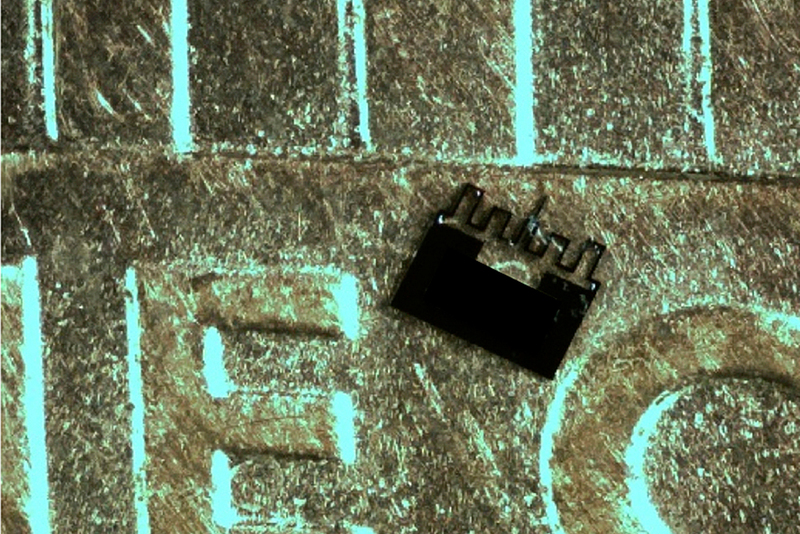 This image shows a "microforce-sensing mobile microrobot" juxtaposed against a U.S. penny. Researchers are using a technology likened to “mini force fields" to independently control individual microrobots operating within groups, an advance aimed at using the tiny machines in areas including manufacturing and medicine. 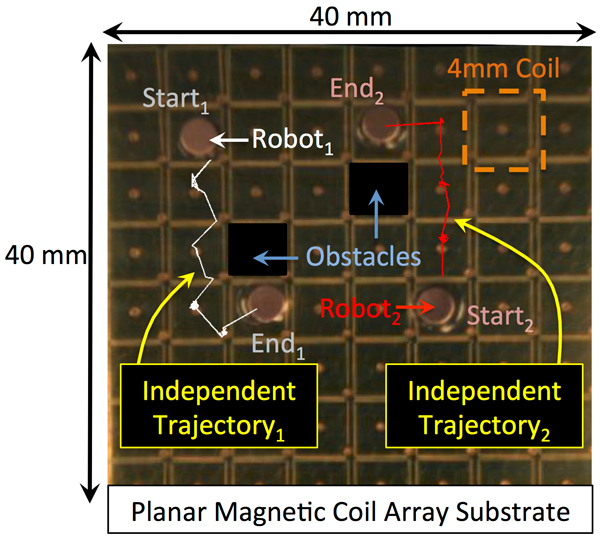 This image shows how two microbots can be independently controlled when operating within a group, an advance aimed at using the tiny machines for applications such as advanced manufacturing and biomedical research. The microbots are magnetic disks that slide across a surface. While the versions currently studied are about 2 millimeters in diameter — about twice the size of a pinhead — researchers in Cappelleri’s lab seek to create microbots that are only 250 microns in diameter, or roughly the size of a dust mite. The robots are moved using attractive or repulsive forces and by varying the strength of the electrical current in the coils. “You can think about using teams of robots to assemble components on a small scale, which we could use for microscale additive manufacturing,” Cappelleri says. Microbots equipped with probe-like “force sensors” might then be used to detect cancer cells in a biopsy. “Cancer cells have different stiffness characteristics than non-cancer cells, and in some of our previous work we put force sensors on the end of these robots to figure out which ones are stiffer than others,” Cappelleri says. The original coils were made by printing a copper pattern with the same technology used to manufacture printed circuit boards. They can be scaled down from their current size of about 4 millimeters. A new process, however, was needed to create a microscale prototype, he says. The team will attempt to use microscale prototypes to assemble components for MEMS devices. One potential obstacle is the effect of van der Waals forces between molecules that are present on the scale of microns but not on the macroscale of everyday life. The forces might cause “stiction” between tiny components that affect their operation. Purdue’s Multi-Scale Robotics and Automation Lab website, multiscalerobotics.org, has more details on the research. The National Science Foundation has funded the research.